· HDMI signal 4k* 2k at 30Hz or 1080P at 60Hz. High-resolution video to your 4k monitor screens. · USB 3.0 port, fast enough to transfer high-definition videos, movies or data files in just few minutes (data transmission rate is up to 5G bps). · SD/TF card reader, quickly to read and transmit, support memory card models:SD/TF/SDHC/SDXC. 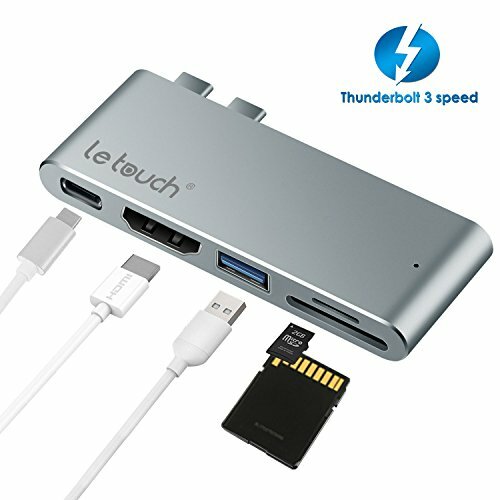 · Expansion design, ideal for Macbook Pro users who want to connect mouse, storage devices, phone and other USB devices to new Macbook Pro that only with dual Type C port. 1. Although the latest PD chipset is in use, still there's heat that generated while charging. 2. Please don't use SD card and Micro SD card slots at the same time. By default computer will read the first card when inserting both at same time. 3. When connecting the mobile hard disk or external drive to USB Type-C Hub, please make sure to plug in external power.